University of Alabama's student government recently agreed to desegregate their Greek sororities and fraternities. Good job, guys! Also, you do know it's 2014, right? The Machine is made up of representatives from numerous fraternities and sororities. These individuals help decide what candidates for SGA should be endorsed and funded, thus ensuring that the Greek agenda has consistently strong majority representation on campus. As The Crimson White reported, 27 members of SGA "voted yes to keep the bill from being voted on, 5 no, and 2 voted present." A few weeks ago, Alabama SGA's Twitter account was hacked and tweets were sent out alleging that candidates were pay $5,000 to run. Still, the bill “doesn't require any immediate action by the university or Greek houses, rather, it simply voices support for the goal of integration.” Despite the heel-dragging, last year a few African American female students were offered acceptance into all-white sororities at the behest of university administration, which denounced the segregation publicly. Another sorority elected a black president. But these actions came after media coverage of their segregationist shenanigans. Meanwhile, The Machine seemed to be bolstered by the press, albeit negative, and their "secret" control of UA Greeks. This retro-nightmare was Alabama student government president Hamilton Bloom’s first dalliance with a controversial measure. He was reportedly backed by The Machine — and perhaps paid? — for his position. "I believe the resolution passed tonight is a great solution," Bloom said in a statement Thursday. "My administration and I are dedicated to seeing and encouraging results in the integration of both fraternities and sororities, and I believe the resolution passed tonight, in addition to the Diversity Caucus which will be introduced soon, are incredible first steps." Listen: These kids do not get a cookie for doing something their student body should’ve done in 1963. This is why minorities get so upset — old paradigms like segregation should not be something that still needs to be legislated, and certainly not at the collegiate level nor at the very school where President Kennedy sent the National Guard to reel in the racists so black students could integrate UA's classrooms in 1963. Furthermore, would you want anyone associated with revoking this “bill” or The Machine working for or interning beside you? I wouldn’t. They’re still trying to climb their way out of the background scenes of Forrest Gump. 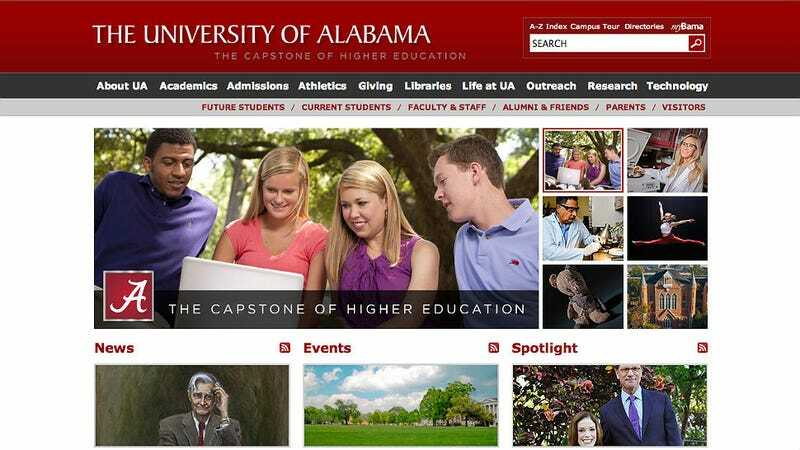 While University of Alabama has long been integrated on the administrative level, that clearly didn’t trickle all the way down to the student body. I’m surprised that the UA administration even allowed this issue to even come up for a vote among the students, considering their public position on the subject. Why not just enforce integration at all levels? Their campus, after all, was the national example of integration by force. But resistance runs deep; as the media continues to blast and shame these backward kids, the campus is facing integration by media force. As much as residents of Southern states like this want to say times have changed, UA is upholding the biggest stereotype of all: that they long for the old days and are fighting tooth and nail to keep the nostalgia alive. Image via University of Alabama.